With the help of Gene Winfield, AMT Corp. was planning to manufacture a limited production, two-seater sports coupe. To help promote their introduction into the world of real cars, AMT decided to go drag racing. 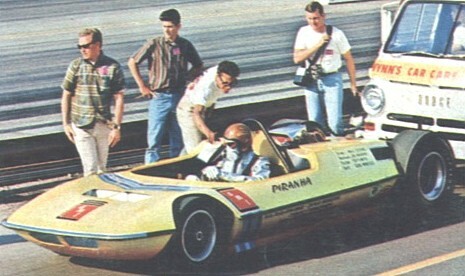 Under the direction of Winfield, the Piranha drag racer was built as an exhibition car and match racer for the booming funny car class. It recored a 182.64 mph, 8.81-second e.t. during it's first public appearance and was one of the first dragsters to threaten the 200 mile per hour barrier. 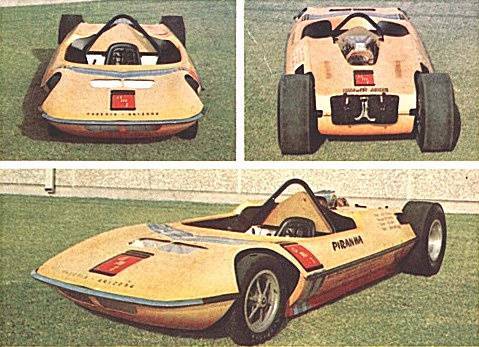 Featuring a body made of Cycolac, the chassis was designed and built by Fred Smith. The bare frame weighed only 68 lbs. and featured a tubular front axle that was suspended by a transverse torsion bar. The car had a 120" wheelbase, overall length of 148", and body height of only 29". Engine builder Joe Anahory tuned the blown 392 c.i. Chrysler Hemi to about 1400 horsepower on 95% nitro at 7,200-7,500 rpm. The body was painted a fantastic, glistening lemon-gold that flowed into a bronz-tone lower body by Winfield. Driven by Walt Stevens, the car was a showstopper wherever it appeared.